The Araliaceae is a family of flowering plants that includes 254 species of trees, shrubs, lianas and perennial herbaceous plants. Devil’s club is related to well-known medicinal plants, including the Asian ginseng (Panax ginseng C A Meyer), the American ginseng (P. quinquefolius L.), Eleuthero (Eletherococcus ginseng Maxim) formerly called Siberian ginseng, and Sarsaparilla (Aralia nudicaulis L.), (Lantz et al, 2004). The entire proving of Devil’s club is available online (see below: De Pieri, 2007). It is interesting to connect the chemical composition of Devil’s club with the symptoms from the proving, as also with the use of the plant by First Nations. The chemical analysis of Devil’s club (Kobaisy et al,1997, Moore 1993, Xu L. 2000) isolated certain compounds found to have significant anti-mycobacterial and anti-fungal activities. These compounds are most active against common bacteria such as Staphylococcus aureus, Bacillus subtilis, Pseudomonas aeruginosa, Escherichia coli and Candida albicans – all bacteria regarded as the cause of serious infections and currently becoming resistant to most of the known available antibiotics. Further, other compounds found in Devil’s club were active against Mycobacterium tuberculosis and Mycobacterium avium, both held to cause tuberculosis in immune-compromised hosts. A number of rubrics concerned a dry and persistent cough – a cough that would eventually bring up yellow, gray, green mucus streaked with blood. The need to be in the open air was also found in the journal of several provers. The tickling cough was aggravated by dust, smoke and exertion. Accordingly, it was fascinating to find that the First Nations (Pojar and MacKinnon, 1994) have been using Devil’s club, taken in the form of a tea, to treat tuberculosis (Lumni, Skagit, Dena’ina First Nations). Further to this theme, a number of provers reported cravings for sweets between meals. There was a sense of weakness and loss of energy, feeling depleted and drained, together with vertigo or lightheadedness experienced before breakfast or a meal. The sensations were resolved with eating: these are all symptoms associated with diabetes. Likewise, First Nations use the tea from the inner bark of the Devil’s club to heal diabetes. Another aspect found in the proving of Devil’s club is its affinity for the joints, especially pain in the extremities and in the back. The pain rubrics in the back included burning, biting, stitching, stiffness, aching and soreness. The pain was better by heat, lying down, and motion. The pain was worse in the morning, going downhill, and going from sitting to standing. The types of pain in the extremities included cramping, numbness, lameness, sore, sciatic pain, pulsating, intermittent, pulling, and pinching. Knees and hips, as well as the arch of the foot, were most affected. There was also a swelling, with stiffness and sensitivity to pressure. These symptoms from the proving can be associated with rheumatism and arthritis – although, of course, for a homeopathic prescription the rest of the remedy picture would need to match. 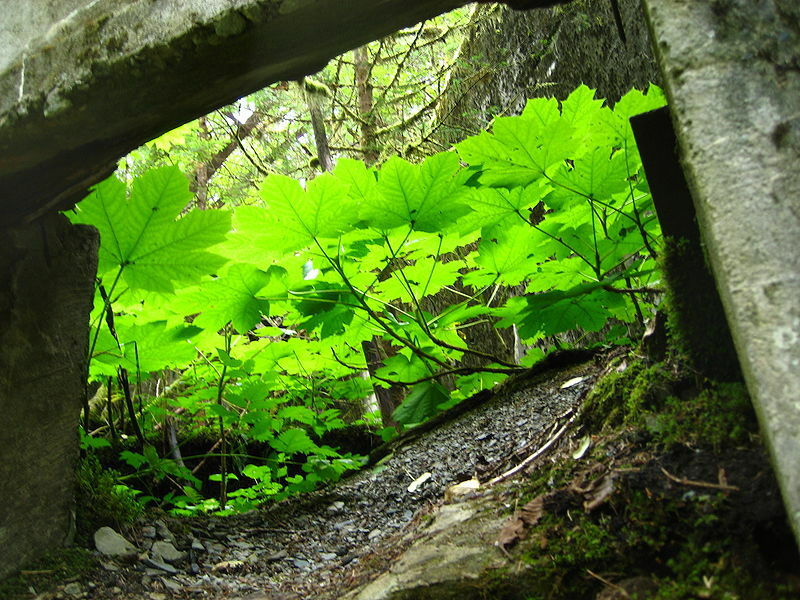 Once again it was fascinating to learn that First Nations used Devil’s club as a tea for rheumatism and arthritis (Nuxalk, Ditidaht, Coastal Sahish, Cowlitz, Sechelts, Squamish, Halq’emeylen: see review by Lantz et al, 2004). There is a growing concern (Lantz et al, 2004) with respect to the harvesting of wild Devil’s club; it is harvested because of its anti-fungal and anti-bacterial properties and also for its ability to help with diabetes. When I first decided to do a proving of Devil’s club, I was puzzled by the need of this plant to put such effort into defending itself, with such stout thorns on the stems and even under the leaves. The thorns on the stem break easily and the tip of the thorn imbeds itself in the flesh, causing a localized infection. The area becomes red and swollen, with a dull pain; within a few days a green-gray tip appear, the area starts to throb and the pain increases. Eventually the pain resolve when the pus is discharged. This is notably similar to the typical picture of Staphylococcus aureus infection in the skin, to MRSA or to certain Superbug infections. Given that “like cures like,” a substance that can cause disease in a healthy volunteer can heal the same disease in a sick person. Devil’s club can cause a Super-bug-like infection: will it be able to address a Super-bug infection? The plant defends itself, as is evident both from its form and from many of the provers’ experiences. However, the themes of protection and defense apply not only to the plant itself, and to its dynamic effects: the same themes can be observed in the past, in how the First Nations used this plant, as well as in the present, with respect to the survival of the plant species. With regard to this survival, although Devil’s club is still found from the Alaskan coast down to central Oregon, Montana and Idaho, and around Lake Superior in Michigan and Ontario, it has been placed on the USDA Threatened and Endangered species in Michigan State. It need hardly be said that naturopathic tinctures and pharmaceutical preparations require large amounts of the plant, whereas preparation of the homeopathic remedy uses only the smallest amount of the substance. Homeopaths, in this way, remain faithful to, and aligned with, the protection theme of Devil’s club. Strength, as with the themes of violence and of protection, was a central aspect of the proving. During the day there was a feeling of strength, confidence and knowing that you can do anything; at this same time there was a desire for company. Later on, this feeling was replaced by exhaustion, ennui, lack of energy, and depression, and there was a need for solitude. The lack of energy brought the need for stimulants; provers wanted to have beer and coffee, even if they would not usually have had desires for such drinks prior to the proving. The night was full of violent dreams and of dead bodies, murdering, drugs dealers, sickness, and of humans destroying the Earth. There were dreams of people, gathering around the world, seeking ways to survive on this planet with its present overcrowding. As noted, protection is a big part of this remedy - not only the plant protecting itself, but here also protecting the species, the First Nations, the health of people and the entire planet, all experienced in vivid dreams during the proving. There were also dreams of people gathering in celebration. One picture that came into my mind was of veterans: after being in battle, on returning home, they can become depressed, isolated, and they often need stimulants. Of the veterans that I know, their dreams are so horrific that they will usually refuse to talk about them. Once again, if the remedy picture matches, Devil’s club may be of use for people with Post Traumatic Stress Disorders. Despite it being clear that the ulcer was healing, at one point she was put on antibiotics; the draining and the healing slowed down. She had surgery on that leg and her leg got infected again; the other leg also developed a hole, with burning pains. Over time, the drainage returned and her leg healed. After two grafts and the antibiotics, even the nurse agreed that it was the homeopathic Devil’s club that had turned the case around. The last time we saw her she was running downstairs, because a taxi was waiting for her. She has since moved in with her family and is raising kids, just like her grandmother did. Lantz T.C., Swerhun K., Turner N.J. (2004) Devil’s Club (Oplopanax horridus): An Ethnobotanical Review. HerbalGram, 2004; 62: 33.48. The Journal of the American Botanical Council. Lucy, this is a great gift to the homeopathic community. I&apos;m especially happy to hear the voice of a plant that is so plentiful in my neighborhood (Oregon). Thank you! Thank you for the insight into this remedy and it&apos;s healing power.